Simple machines help people do work. We will be rescheduling our Trio Beach hike and Hebe Haven water activity day and we will communicate when that will be at a later date. There a few lost and found items (KJS PE kit, sweatshirts, t-shirts, raincoat, etc) that we collected from camp that did not have names. We have encouraged all students to take a look; the remaining items will be moved to the KJS lost and found at the end of the week. Thank you to everyone who was able to make it to our amazing Y4 Art Show on March 5th. It was incredible to celebrate the talent and creative process the students went through. We also appreciate all the feedback that was left for us to reflect on. It was a wonderful way to end our How We Express Ourselves Unit! To support students ability to write science experiments we will focus on formulating compelling and relevant questions that they will research to deepen their understanding. We will spend time recording an experiment from a bird’s eye view as well as a side view. Students will continue to develop their speaking and listening skills as they gain information needed from watching scientific videos and also share their new knowledge in both small and large groups. 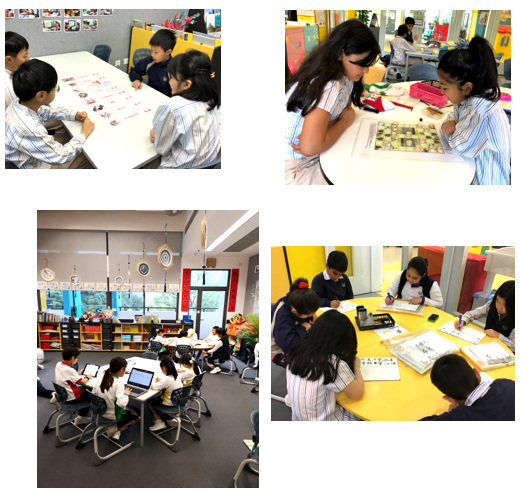 We will continue to practice the reading strategies we have developed, and for this unit we will have a particular focus on the comprehension strategies, synthesising, asking questions and summarising. We want students to be able to read a variety of texts and be able to pick out the key words in order to identify the main idea. Explanation and procedures will frame the writing we do during this unit. As students complete their scientific investigations we want them to be able to explain how or why something is happening. We will focus on certain parts of scientific experiments and how to record them but we want all students to understand how a scientific experiment is organised. Consider exploring these keywords in your children’s mother tongue to help comprehension. We will continue our number work focusing on multiplication and division strategies to build maths fluency. Visualise – Can you create an image in your head which shows the problem? Connections – How does the problem/situation connect to other things? Questions – What questions can you ask to deepen your understanding?